When Odo was under suspicion for murder, Bajoran nationals let by Zayra demanded that the changeling be handed over to them. 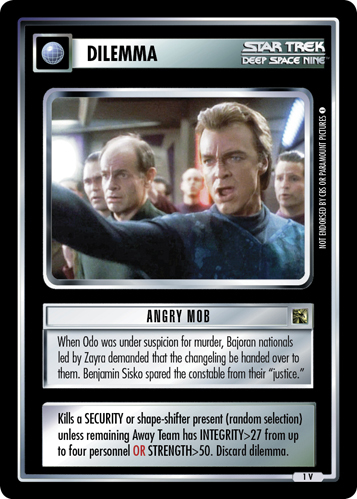 Benjamin Sisko spared the constable from their "justice." Kills a SECURITY or shape-shifter present (random selection) unless remaining Away Team has INTEGRITY>27 from up to four personnel OR STRENGTH>50. Discard dilemma. 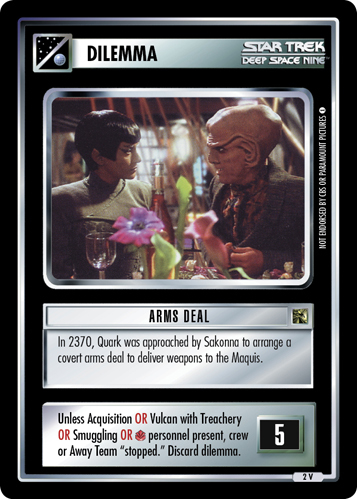 Image Source: Deep Space Nine: "A Man Alone"